The Chinese government has admitted for the first time that decades of reckless pollution have spawned a string of toxic “cancer villages”.The admission by China’s Environment ministry came in a five-year plan on tackling pollution. “In recent years, toxic and hazardous chemical pollution has caused many environmental disasters, cutting off drinking water supplies, and even leading to severe health and social problems such as ‘cancer villages'” the document says. Environmentalists have long campaigned for the government to recognise and help the hundreds of cancer clusters caused by poisoned soil, water or air. In 2009, Deng Fei, an investigative journalist helped to plot some of the worst-hit villages on a Google map. The plan outlines a clampdown on the use and production of 58 types of toxic chemical. “The document warns that China faces a grave situation in terms of chemical pollution control, citing inadequate pollution risk control by enterprises, a lack of systematic policies to restrain the making and use of highly toxic and dangerous chemicals and authorities’ insufficient pollution monitoring and supervision capabilities,” state news agency Xinhua reported on Friday. The plan’s publication comes amid a growing public outcry over the toll pollution is taking on public health. Cancer is now China’s biggest killer, and cancer rates have surged since the beginning of China’s economic miracle. One in four Chinese now die from cancer, and there has been an 80pc rise in the mortality rate from cancer over the past 30 years. Experts predict that lung cancer rates will continue to skyrocket because of air pollution, even if China’s addiction to cigarettes is brought under control. Since January, repeated bouts of toxic smog in Beijing and other major cities have thrust the issue of air pollution to the top of China’s political agenda. This month the focus has shifted underground, with a series of local media reports on how factories are allegedly pumping huge quantities of toxic waste into groundwater supplies. The issue of groundwater pollution hit the headlines after Mr Deng launched an online campaign inviting internet-users to post photographs of polluted rivers near their homes. Mr Deng said he was “petrified” by the state of China’s waterways. “If things continue like this, we will all be doomed,” he said. 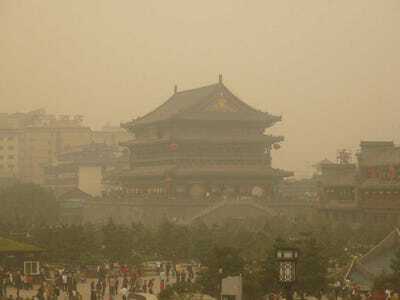 Ma Jun, who runs the Institute of Public and Environmental Affairs, said government officials had traditionally claimed there was insufficient scientific evidence to link “cancer clusters” and pollution. While more research was required to establish a clearer connection, Mr Ma said China urgently needed to follow in the footsteps of the United States and Japan by adopting “precautionary” measures. Mr Ma said the government’s acknowledgment of “cancer villages” was part of an ongoing shift towards greater environmental transparency.